Sometimes it’s nice to really show off what 3D printers are capable of, and we think these 100% 3D printed tank tracks (no metal bearings or metal shafts) do just that. In this article, I’m going to tell you how we designed and printed these open source tracks. (I’ll put the link to the downloadable files at the end of this article, feel free to download and modify at your leisure). Apart from being really easy to print, these tank tracks display a range of 3D printing design considerations and are an education on making the most of the various filament materials available to you. This entire project can be printed without any supports. With a well dialed in printer, you can expect to easily get fantastically finished tracks just like ours in the photo. It’s worth noting that these tracks were originally designed as a demo to show off our range of rigid.ink 3D filaments, but with some slight modifications we don’t see why they could not be used for an actual model tank, or tracked robot design. 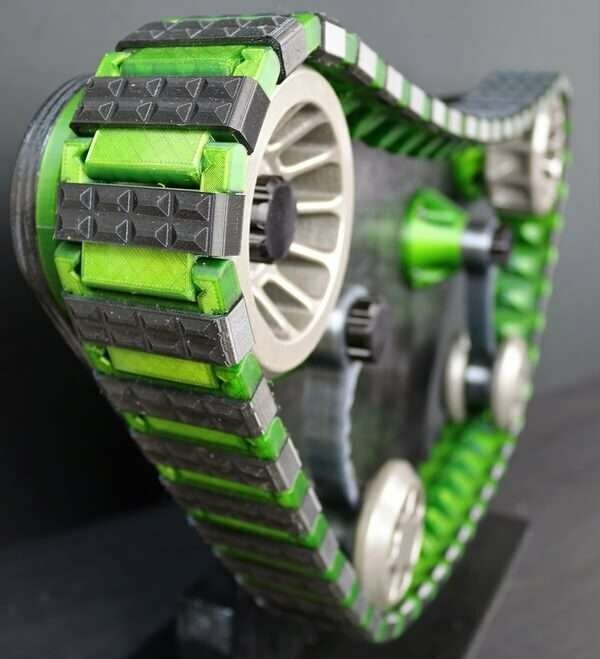 The materials we used were Translucent Green PETG for the tracks and “organic” adjustable suspension, black TPU for the track treads, acetone smoothed Silver ABS for the wheels and black Nylon for the bushings. It was important these bushings were low friction, so Nylon’s low friction coefficient worked brilliantly. You don’t need to use the same materials we used – you can print everything in PLA if you like. We just concluded that this mix of materials was the best for our intended purpose. In the end, the tracks ran almost continuously for 3 days for the TCT show where we exhibited them. So it’s safe to say the design and material choices worked out great for the purpose intended. Whether or not they’d withstand rolling over a landmine in the field is another question. Although we suggest you don’t try to find out. First, I sketched up some extremely rudimentary drawings, to illustrate roughly what we were looking to achieve. You'll see here what exactly I mean by "extremely rudimentary". Then the design wiz Jason Suter got to work crafting my best masterpieces into the individual models to create the whole model. It's safe to say from my sketches, he did the majority of the work here. 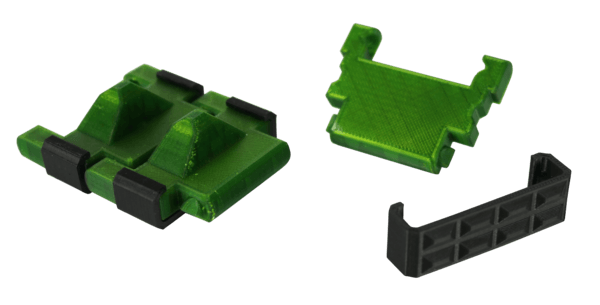 To create a complex design with multiple moving components that need to be assembled after printing to not just print reliably, but also be assembled easily and work well enough for purpose takes a considerable level of design skill. We’ll be doing a more thorough write up of how each component was designed at a later date, so watch this space. 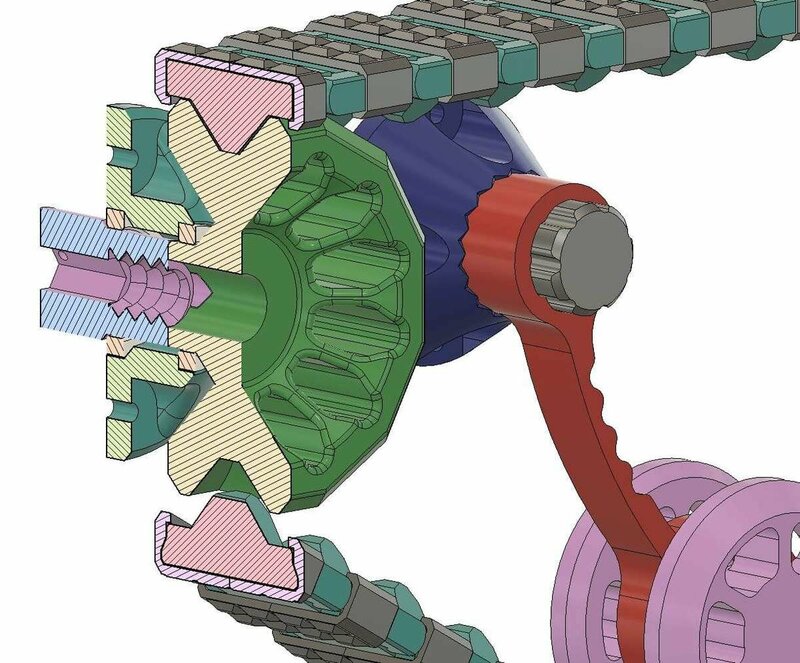 Explaining the design considerations and process of creating interlocking designs with just the right tolerances for 3D printing is beyond the scope of this article. This whole concept is made from just 12 individual designs. You can see that it’s of a modular layout (any other way of saying this more simply?). 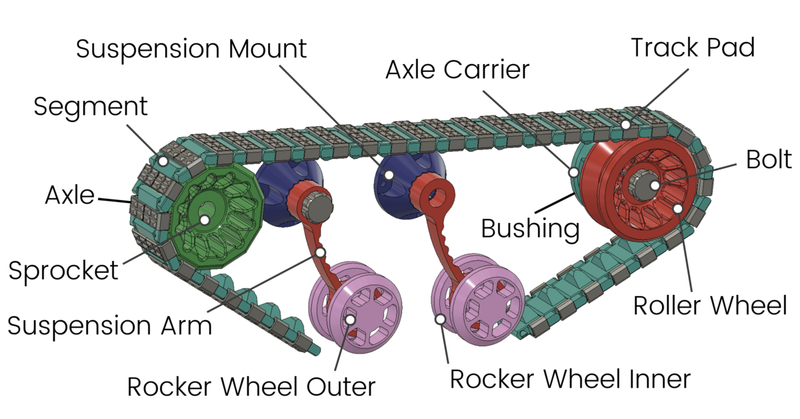 You can easily increase the size and length of the tracks by simply printing more track and suspension components. PETG was chosen for most components due to its durability (strong but with a very slight flex) and very good layer adhesion. 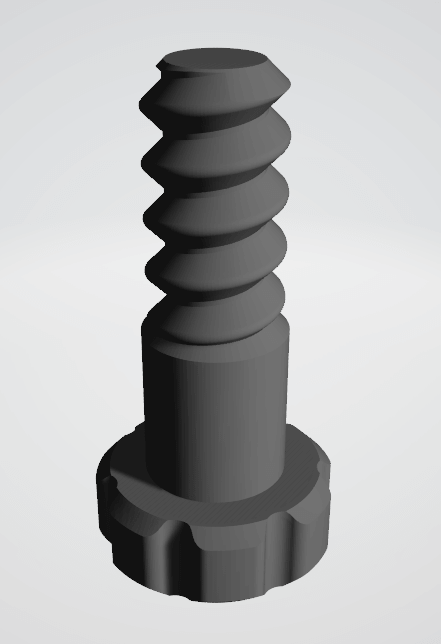 Especially appropriate for the bolts, where tightening them will force the layers to split with a weaker material. I’d recommend printing the Bolts at 100% infill and slightly hotter for extra strength, it’s also worth having a few spares. If printed in PETG, The Suspension Arms should also be printed slightly hotter. If you opt to print these in something flexible, you may wish to print in 100% infill for enough stiffness to support the tank/robot they’ll be under. If you plan to print your tracks in the same materials as we used, it makes sense to spend a few minutes making the most of your print bed area printing duplicate items, or mixed objects of the same material. How many segments can you arrange on the bed, without overcrowding, leading to a potentially higher failure rate? The oversized 3D printer-friendly bolts fit together easily yet snugly. The model has a reassuringly low amount of slackness to it. Make sure you take care assembling the Roller Wheel and Sprocket onto the Axle, aligning them up and slotting the grooves home before tightening with the bolt. There are two Nylon bushings that go into each wheeled section. Take care to assemble the Segments into each other, you need to place them into the corresponding grooves on each one by angling at 90° before it will slot in. After you’ve built the tracks, then add the clip-on grips. You’ll notice the ratcheting on the Suspension Arms and Suspension Mounts for adjustment. We needed to fine tune how tight the tracks were, so carefully used a heat gun to lightly add more bend to the Suspension Arms, which also allowed better suspension. Be careful if you opt to do something similar. We used an RC car wheel 12mm adaptor to power the tracks from a cheap worm gear motor from eBay. Make sure you choose an RPM that suits. Our first motor was a 100rpm output, which gave the tracks around a scale speed of 30 KPH. This wasn’t stupidly fast, but a fast pace and soon burnt out the motor. The second motor, identical just with a higher torque, lower ratio output of 25rpm lasted indefinitely and didn’t get hot. You can of course use a simple motor driver to control speed. There you have it. To download the files and have a go printing it yourself, click the links below.